A recent federal court ruling serves as a potential warning in the age of social media for photographers to put prominent watermarks on their work or their photos may be used for unauthorized political purposes. U.S. District Judge Dana Christiansen ruled against Missoula photographer Erika Peterman’s effort to show that the Republican National Committee violated copyright laws by using her photograph without permission. Fair use allows people to use copyrighted media without permission if the work is modified to serve as either criticism or parody. For instance, Weird Al Yankovic could use copyrighted music because he changes the words to create a parody. But the law is vague about what counts as “transformation,” so it’s up to the interpretation of the court. In March 2017, the Montana Democratic Party hired Peterman to take photographs at its annual fundraiser, the Mansfield-Metcalf Dinner. 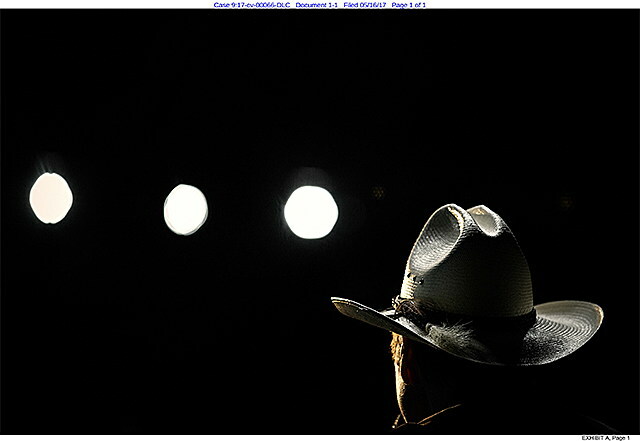 She took several photos of then-congressional candidate Rob Quist, including one taken from behind Quist’s left shoulder as he gazed into three stage lights. Peterman retained ownership of the photos, but gave Quist and the Montana Democratic Party a license to use them. So the Quist campaign posted them on Facebook, without crediting Peterman. The Republican National Committee took the photo off Quist’s Facebook site, cropped it and added the words, “For Montana conservatives, liberal Rob Quist can’t hit the right note.” The RNC argued that the lack of photo credit implied it could be shared. After learning of the flyer, Peterman sued in May 2017. Early in the legal process, Christiansen saw only the modified photo and agreed with Peterman that adding words wasn’t enough to justify a fair-use defense. But he changed his mind after seeing the entire flyer, saying it added new meaning to the photo. Christiansen acknowledged that the RNC “copied essentially the entirety of the work,” which is not allowed under fair use. The user is supposed to use only as much as is necessary for the intended use. But for Christiansen, the case as a whole tilted in favor of the RNC. Peterman, herself an attorney, disagreed with the judge’s ruling. “I think equating political criticism to transformative use is pretty far-reaching. This decision gives any political party or PAC the freedom to use artistic or creative photos for political criticism under the auspices of fair use. This impacts me greatly because I do a lot of political photography and work hard to create compelling, creative photos for the candidates I work with. And like any photographer or artist, I also want to share my work. However, if I know that my photos can be used for “political criticism” without my permission, it creates a major dilemma for me,” Peterman said in an email. The general counsel for the National Press Photographers Association, Mickey Osterreicher, criticized the judge’s decision on Monday. He said the Quist campaign could have sued Peterman if she’d given the RNC permission to use the photo, yet the RNC got to use it anyway. Peterman told Missoula Current she would not appeal the ruling, because the case would probably end up back in Christiansen’s court so the result would be the same.